In 2009 the UN Human Rights Council appointed the South African Judge Richard Goldstone to head the fact-finding mission investigating possible Israeli war crimes committed in Gaza during Operation Cast Lead. Aside from being a well-respected judge, Richard Goldstone could not easily be dismissed as anti-Semitic given his Jewish origin. Goldstone probably had no idea what awaited him. After the Mission published its findings and conclusions, the judge quickly became the victim of a vicious slander campaign. Israel’s Information Minister said that the Goldstone Report was “anti-Semitic.” Harvard Professor Alan Dershowitz informed the listeners of Israel Army Radio that Goldstone was “an evil, evil man” and “an absolute traitor,” a “man who uses his language and words against the Jewish people.” Dershowitz later apologised for calling Goldstone a traitor, saying he thought the term moser (Hebrew for informer, delator) meant “monster” (as if that was any less harsh). In the end, it all became too much for the South African judge. He’s tried to retract parts of the report he co-authored, along with publicly defending Israel against ‘the Apartheid Slander’. And if the truth be told it seems that has never disengaged himself from Zionism. However, the damage has already been done and the greater part of the Jewish community simply has no trust in him anymore. I came to think of Goldstone’s destiny as I was reading Beyond Tribal Loyalties: Personal Stories of Jewish Peace Activists. 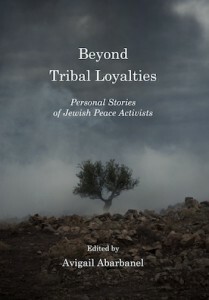 The book is an anthology with contributions from 25 Jewish activists living in different parts of the world who have come to see the conflict from the Palestinian point of view. For most Jews, criticising Israel comes at a price – relatives and Jewish friends regard it as treason, they are accused of being self-hating, and in some cases even of paving the way for another Holocaust. But these stories are not mainly about the price they have to pay for their activism; it’s about their personal journeys that led them from being (in many cases) completely uncritical supporters of Israel and Zionism into defenders of Palestinian rights. I resented the Arab countries around us and our “enemy from within”—or the “fifth column” as the Palestinian citizens of Israel were sometimes called—that I thought wanted to “throw us into the sea”. I resented the world that didn’t seem to understand us and was against us all the time, for what I thought was no reason except our Jewishness. I didn’t understand why “they” couldn’t just leave us in peace. I thought the reason for our suffering, anxiety and insecurity was out there. Together with everyone else I felt hard done by, hassled and unsafe. Abarbanel later left Israel for Australia, where she earned a degree in psychotherapy. As a student she was forced to scrutinise her past. This, along with reading The Iron Wall by Avi Shlaim, led her to renounce her Israeli citizenship and eventually reject Zionism altogether. Ronit Yarosky was also unaware of who the Palestinians were. Her family left Montreal for Israel when she was 14 years old. She did her military service and was stationed in the West Bank. The Palestinian residents served as background actor – they were there, yet unimportant. West Bank cities and towns she stayed in as a soldier “were nameless to me because they were “only” Arab towns, and therefore of no significance in my life,” she remembers. Yarosky’s conversion began as she was working on her MA thesis back in Canada. It wasn’t until she read Benny Morris’s The Birth of the Palestinian Refugee Problem that she realised that Jewish settlements were established on the ruins of Arab villages, and that her uncle was even living in a Palestinian house. When she brought this up with her mother, the latter replied: “Well, obviously.” But to Ronit the newly discovered facts was life-changing, and after she could no longer turn a blind eye to what is happening to the Palestinians. For others like Peter Slezak, Zionism as such doesn’t appear to have been important in his childhood. As a Jew in Australia he felt as an outsider already in primary school. And with most of his relatives being Holocaust survivors, the Haggadah’s warning that “in every generation they [i.e. non-Jews] rise against us to destroy us….” can easily feel validated. Slezak, like many other Jews, used to worry that all non-Jews inevitably harbored anti-Semitic feelings, a worry that took many years to finally overcome. Instead of regarding the Holocaust as a crime against Jews and a proof of why a Jewish state is needed, he sees a universalistic message in Never again. Some Jewish friends have even cut all ties with Selzak, and he has in his own words ended up “becoming a pariah in my own community” because of his pro-Palestinian activism. This culture of intolerance is well captured by American musician Rich Siegel when he describes himself as “a cult survivor.” There is something “very seriously wrong with Israel, and with the culture that supports it,” he writes. Siegel should know. He was an ardent Zionist as a teenager, even to the degree that he was out in the streets protesting Arafat’s appearance at the UN in 1974, this while singing along to lyrics such as “We’ll kill those Syrians.” For Siegel, the image of an innocent Israel threatened by Jew-hating Arabs first started to crack while waiting for his wife outside a train station in Rhode Island in 2004. A few activists had a book stand outside the train station and he perused Phyllis Bennis’s Understanding the Palestinian-Israeli Conflict: A Primer. He was left shocked after reading about Jews massacring Arabs at Deir Yassin, something he had never heard of. He kept on reading books about the conflict and came to understood what Zionism represented. Some of his friends and relatives are no longer part of his life, but he has no regrets. I have here only presented glimpses from some of the 25 contributions, but they all deserve to be read in full. As a non-Jew it is difficult too fully relate to the sacredness of the Jewish state. However, all people and cultures have their taboos that cannot be disrespected without running the risk of being questioned, persecuted or excommunicated. On a personal level, we all have inner demons holding us back until we have the courage to face them. Hardly surprising, fear is a reoccurring theme in the stories. Zionism thrives on fears – fear of the Arabs who want to kill the Jews just because of who they are; fear of the non-Jewish world that doesn’t understand Jews because there’s an anti-Semite living in every Gentile. It is only by challenging and facing their fears that Jews can detach themselves from Zionism. In the afterword Abarbanel writes that she struggled with finding a common denominator for all 25 contributors. But eventually she did find one thing they all share, which she terms “emotional resilience.” She defines it as “the ability to tolerate uncomfortable feelings without avoiding them or trying to make them go away,” and adds that it includes “the ability to tolerate the experience of being disapproved of, disliked and rejected by others, sometimes even by relatives and close friends.” In plain English: to have the courage to stand up for what you believe in no matter the cost. This is what makes the book so inspiring. 25 stories written by people who struggle because they feel what they are not supposed to feel, because they do things they are not supposed to do. They have the emotional resilience and sense of justice that Richard Goldstone lacks. This article was posted on Wednesday, December 7th, 2011 at 8:00am and is filed under Book Review, Resistance, Zionism.